My first show since Hamburg last September - a little concerned pre-show that the level of performance and energy levels may be starting to slip. Any concern utterly misplaced from the opener "Street Fighting Man" - they tore into the set, the intensity of the band and energy of the front-man self-evident. And the show? 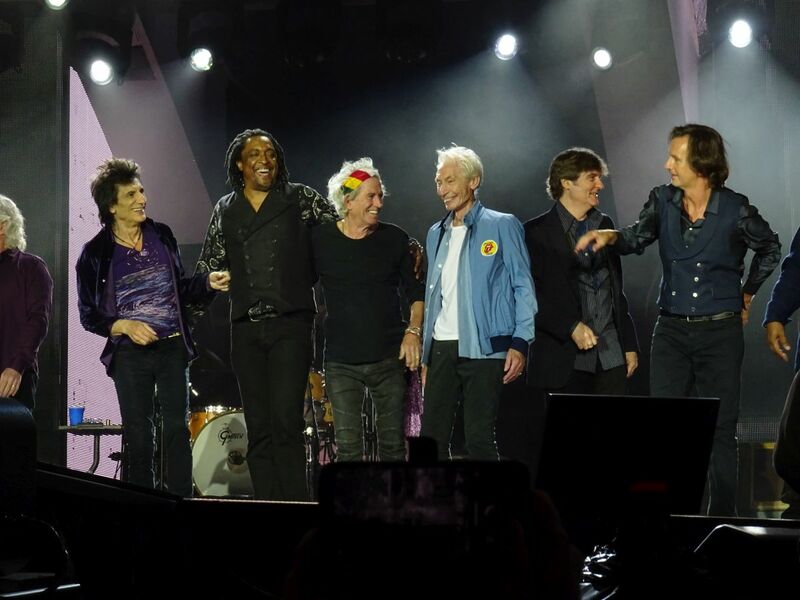 - yes there was an occasional "false start" to a song, yes Sasha's vocal on Gimme Shelter was barely audible, yes the sound was not as crisp and sharp as we'd all like it to be - but this detracted very little from the night's quite fabulous show. 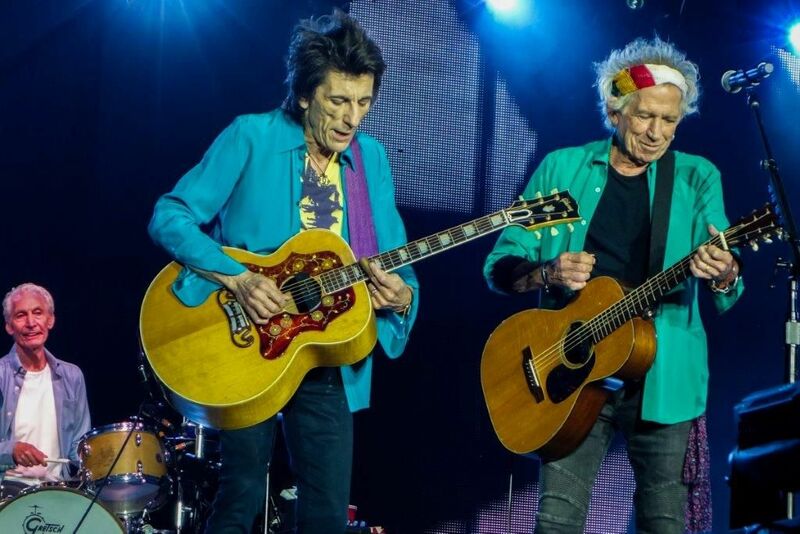 The band dependent on its very core of Keith and Charlie, supplemented with Ronnie's powerful and at times evocative guitar work, the other band members contributing in their own distinctive and effective way. 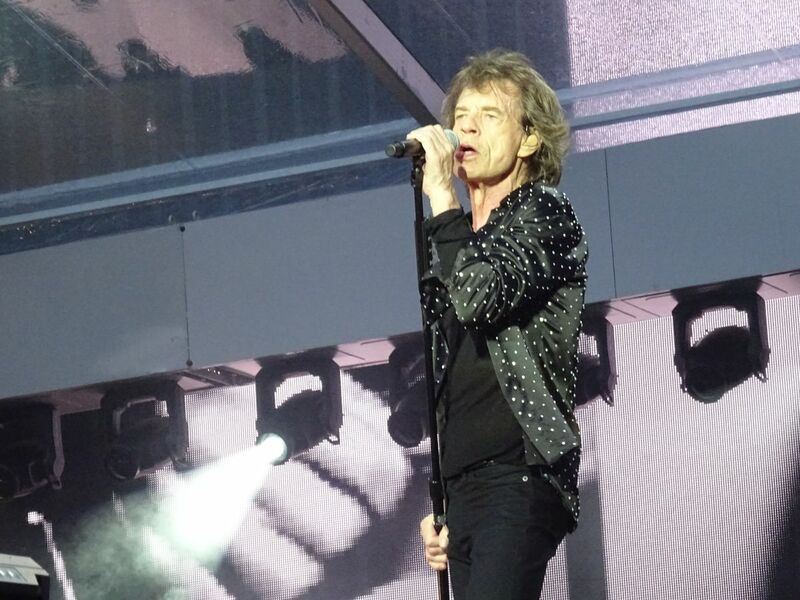 But it is the front-man, it is Mick Jagger who is the mesmerising presence. He demands attention simply by being there - he is front, back, centre, right, left and back again. He is energy. He energises the audience. He plays to the audience and holds them captivated and entranced, all as one. He provokes, he guides, he teases, he cajoles, and he produces the coming together. He is a phenomenon. He is at the top of his game. The greatest showman and a whole lot more - and that's without his stirring harmonica playing and guitar work. The young man is 75 next month and has the stamina and athleticism of many a man half his age. In England the National Health Service would do well to enrol him as their role model for the next "health and fitness" campaign. 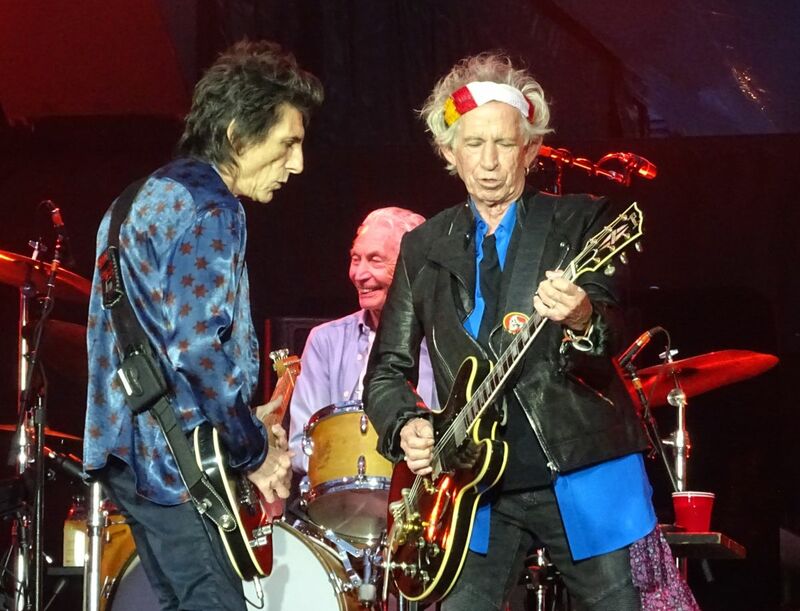 Personal highlights from the show - "Like a Rolling Stone" and "Tumbling Dice", and Mick's audience starter of "Happy Birthday to You" for Charlie. Great, great show. 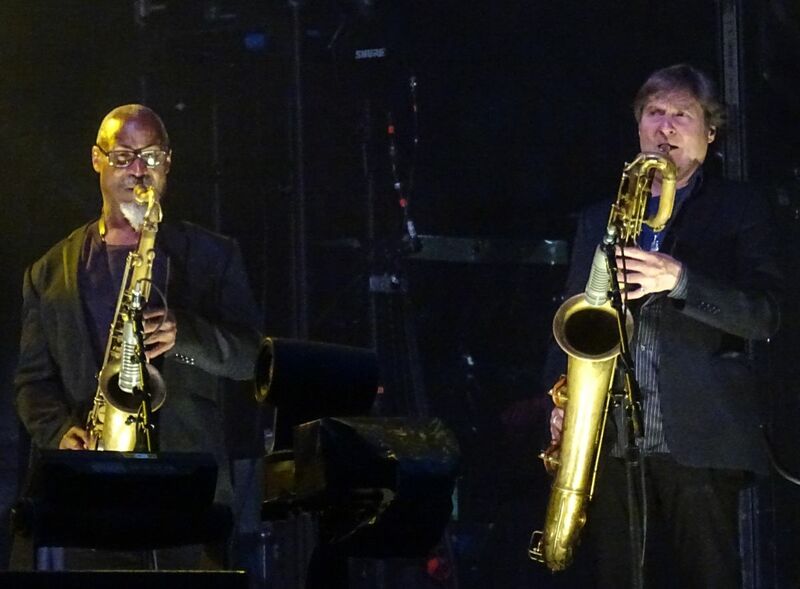 And a particular mention for "The Specials" - Coventry's own, who produced an excellent set. An inspired choice as support - they produced the best audience response I've seen for a support band at a Stones show. When I made my way out of the stadium, after the show tonight, I got the following comment: "You must write a report from this show. It might not be the greatest set list, but it was such a great show..." So here I am, trying to report on what this great night in Coventry brought us at Ricoh Arena. 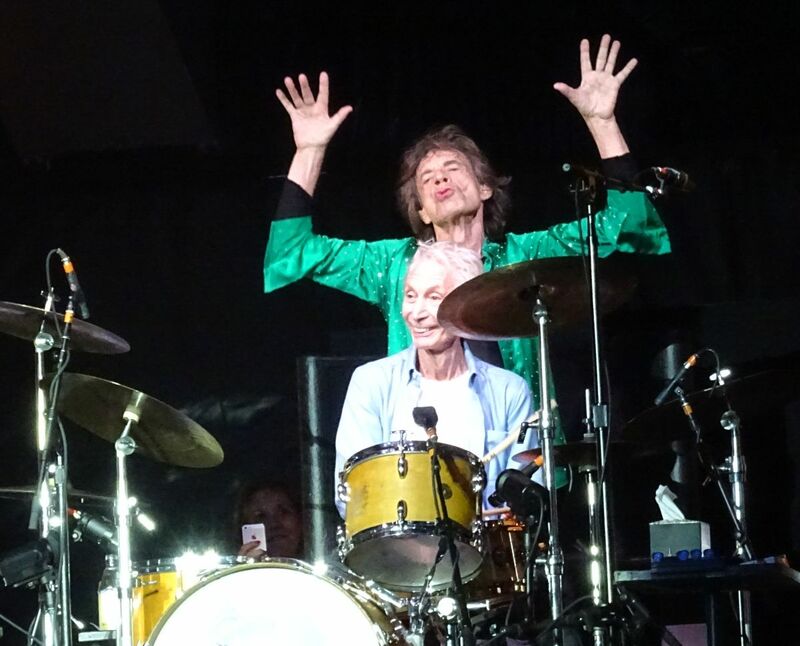 Mick said they had two band menbers who were celebrating their birthdays in Coventry now. 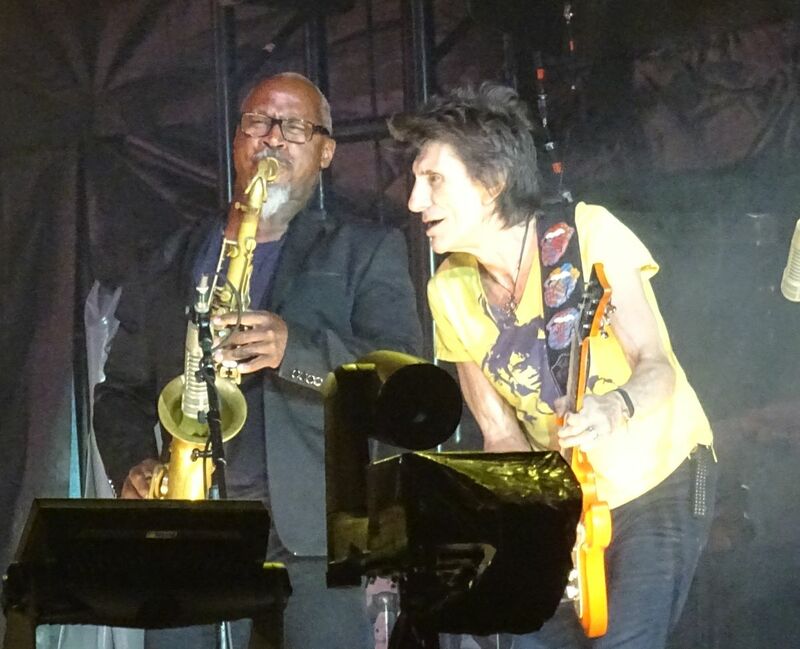 First Ronnie, who celebrated his birthday the day before the show, on June 1. Then today Charlie had his birthday. 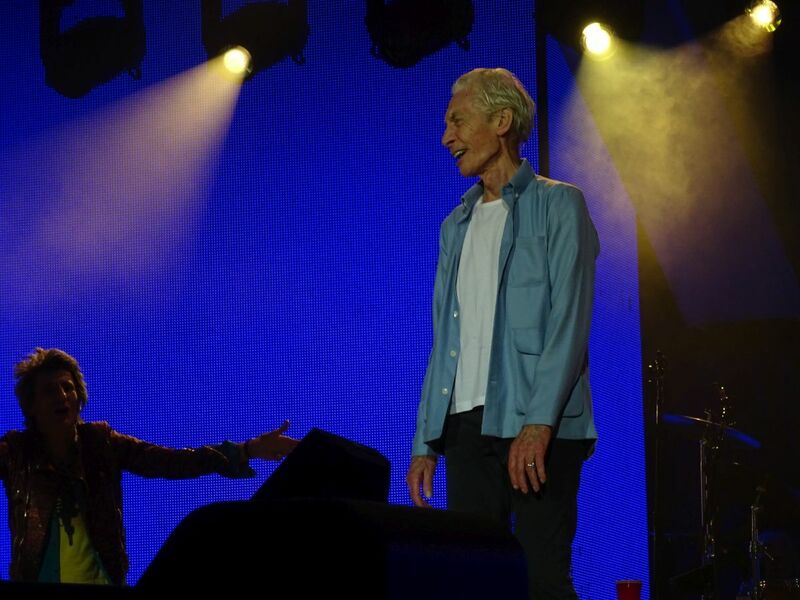 So during the band presentations, Mick took the lead singing "Happy Birthday Charlie!" Rewinding to the start of the show.... It is 8:20pm. "Ladies and Gentlemen... 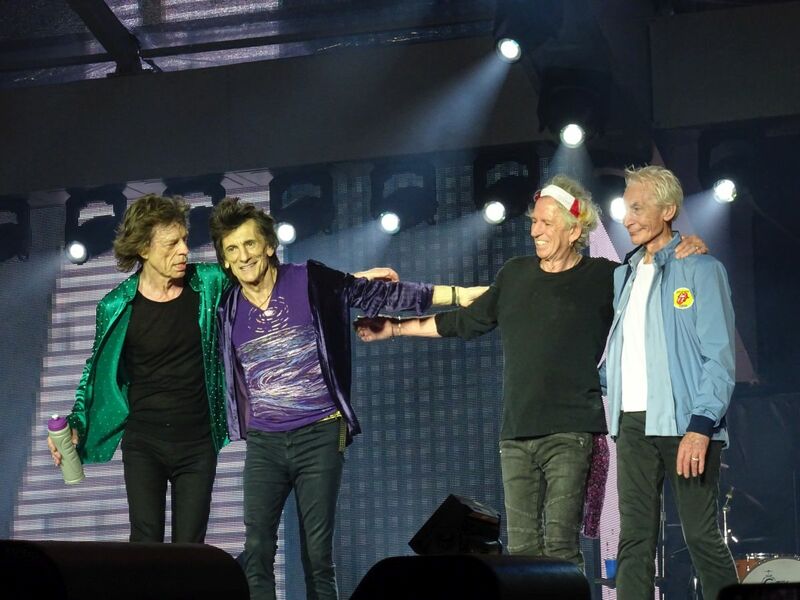 The Rolling Stones". I just love that announcement. The superfan and guitar playing expert next to me, who do know all Keith's guitars, and how to play them of course, had been working hard figuring out what guitars Pierre made ready for Keith during the tuning phase. He was tuning the guitars for several songs, it was hard to guess what would be the one for the opening song. But we got "Street Fighting Man" as an opener. This time the crowd was cool not crazy, there were many mobile phones in the air, but I could still enjoy this very special song as a starter. I wish they could play it every night. 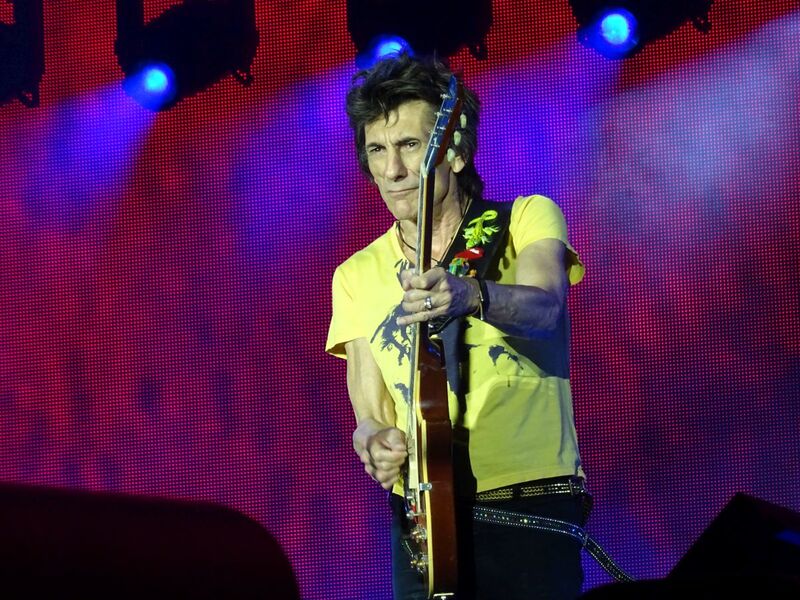 "Street Fighting Man" live is a must for me, it is so much Keith Richards power riffs from the very start. 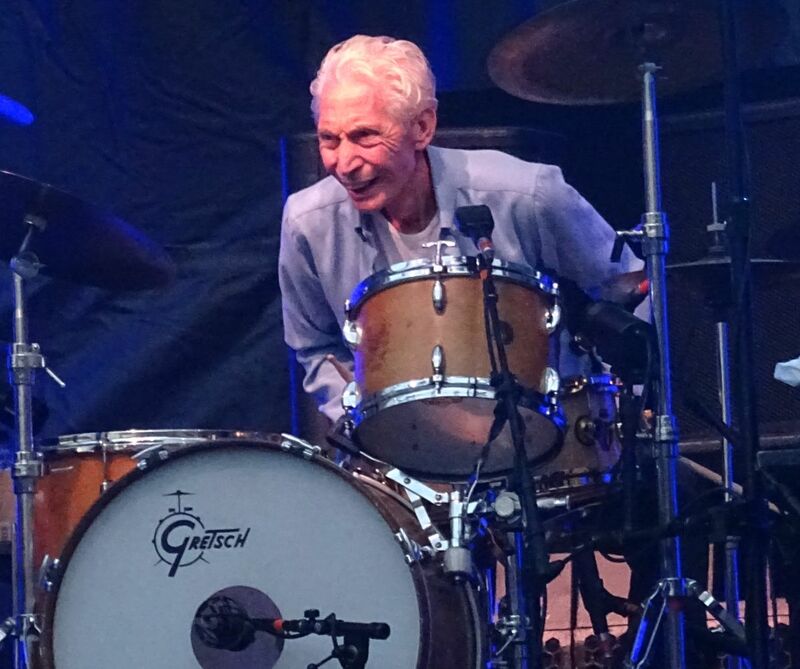 Ronnie was stepping forward every time there was a solo, which he did quite often. 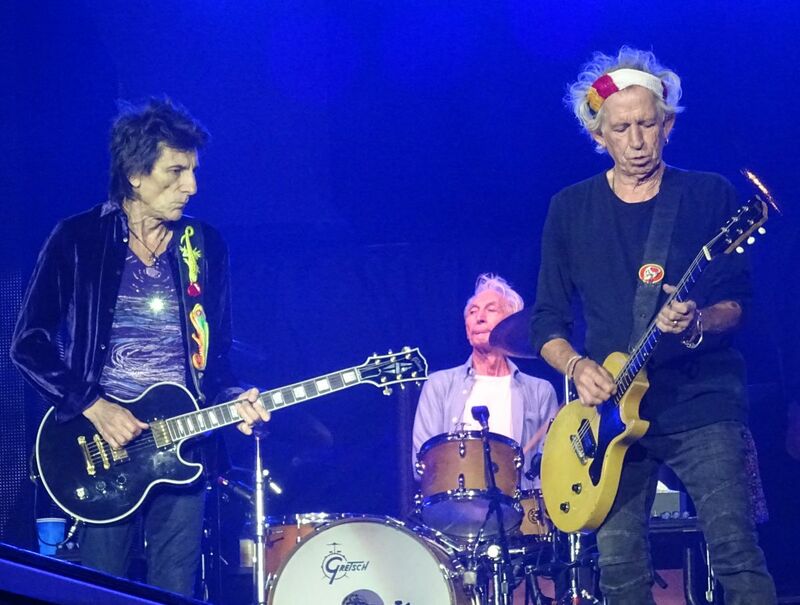 The first time was during "It's Only Rock 'n' Roll". 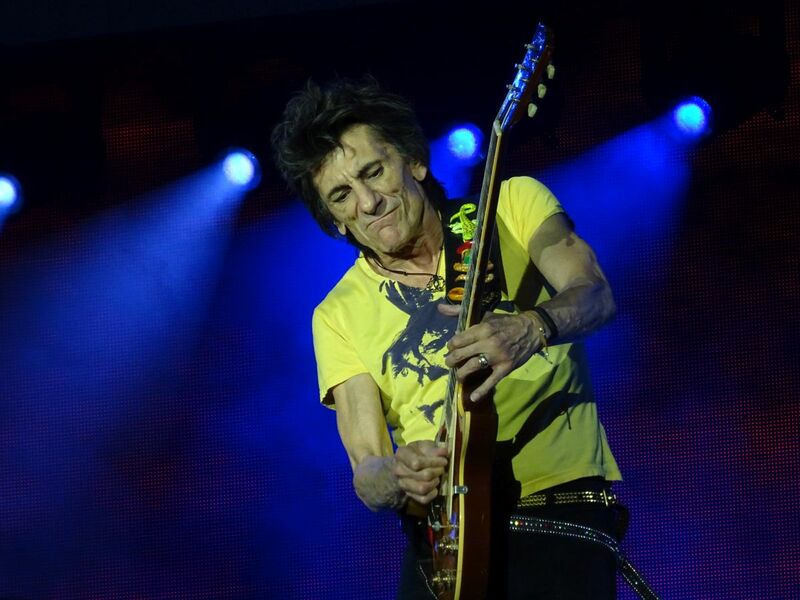 I am amazed by the way Ronnie is able to swing around with his guitar these days on stage, even rushing around, still he doesn't miss a single note, no rumble or stumble and no mess, it's just perfect. 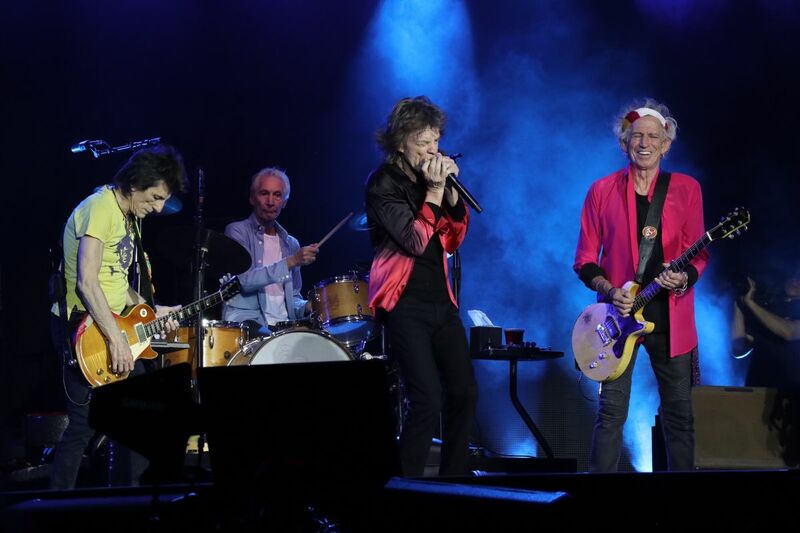 "Like A Rolling Stone". 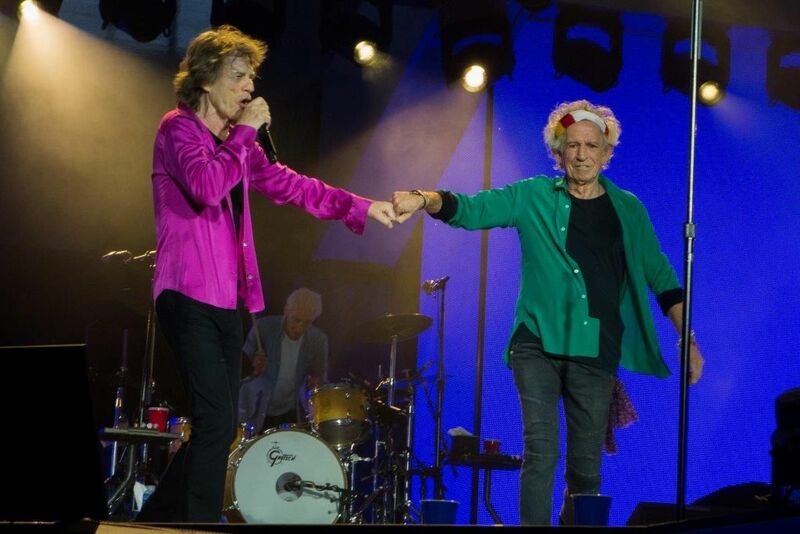 Mick And Keith join in together next to each others for the vocals, sweet posing for the fans, we just love it. 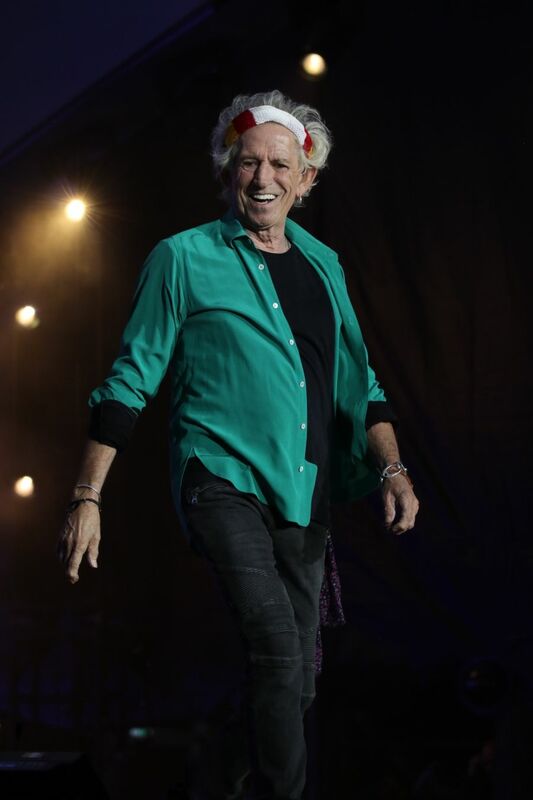 Coming back from the extended stage, during the great sing-a-long on "You Can't Always Get What You Want", Mick is with a big wide smile, saying how great the singing was, then he says something like "I think that is the best one yet". I love it when Mick talks from his heart and not just from the teleprompter. 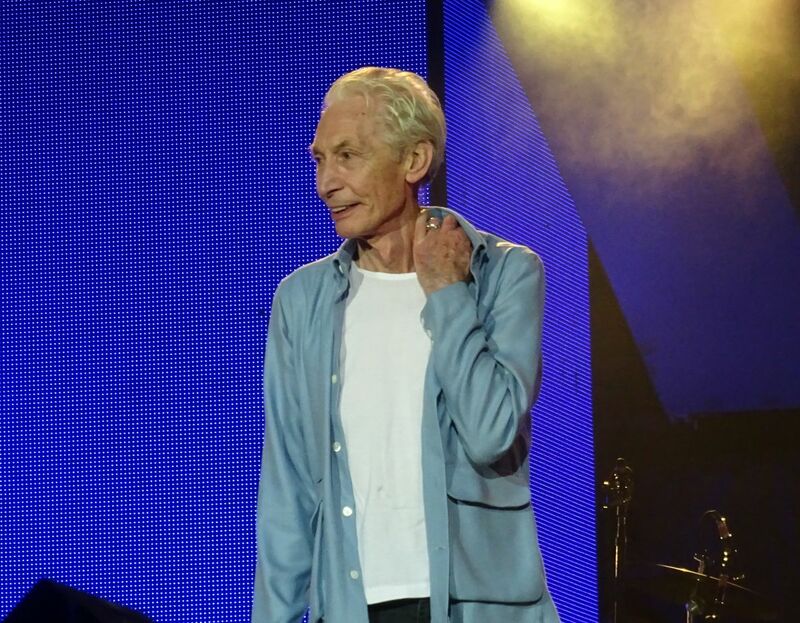 This tour in Ireland and UK has been so enjoying just by the fact that Mick and the rest of the band are so relaxed. I am pretty sure they stay in their homes here in England between the shows, at least as long as they are in the south of England, just 1-2 hours driving from their homes, then they move into the band hotel ahead of the show day to be all together locally. 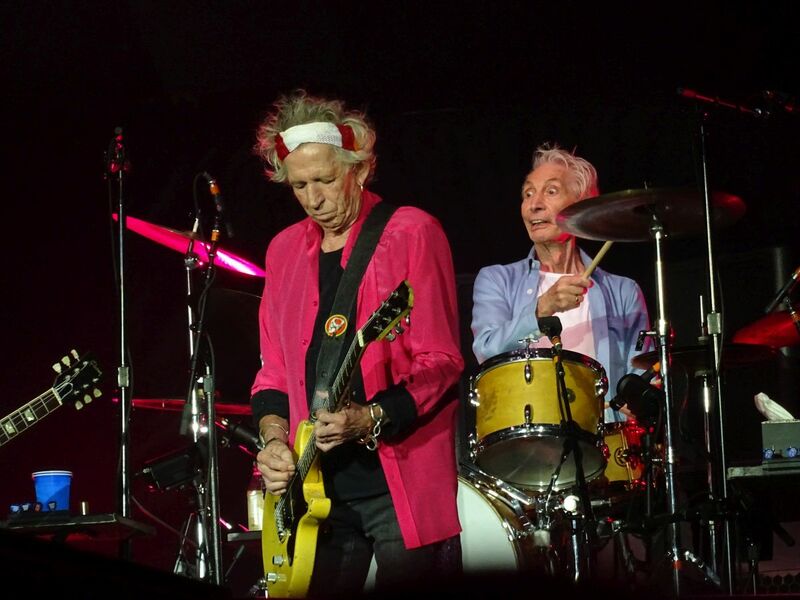 No more late appearences like we had in the "old days" like at Brixton Academy 1995, when Keith arrived late, hearing the rest of the band rehearsing, saying "They started without me!" The band presentations brings me back to the start of this review, it was a celebration of Ronnie and Charlie. 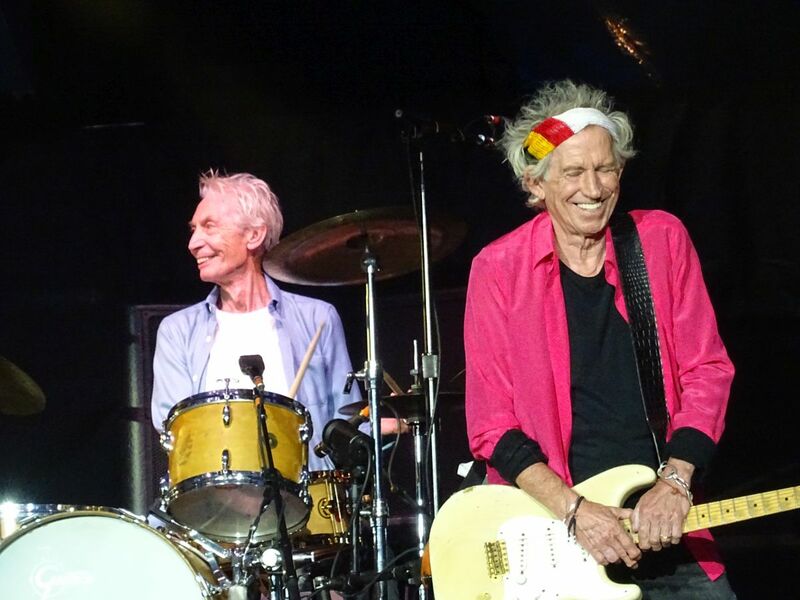 Then Keith did his set, in a great cool way, while Mick took a deserved break from his constant running on the stage. "Sympathy For The Devil". 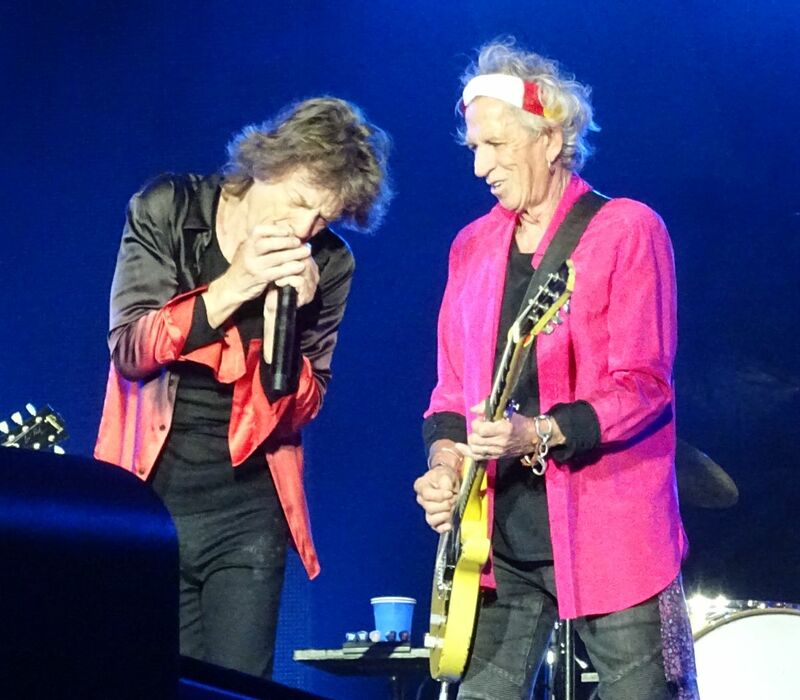 It is getting darker, Mick is up front, with his red and black jacket, singing, then Keith walk forward doing his first great solo. The sound is powered up, this is part two of the show and there is no way anyone should be on a toilet break from now on really. 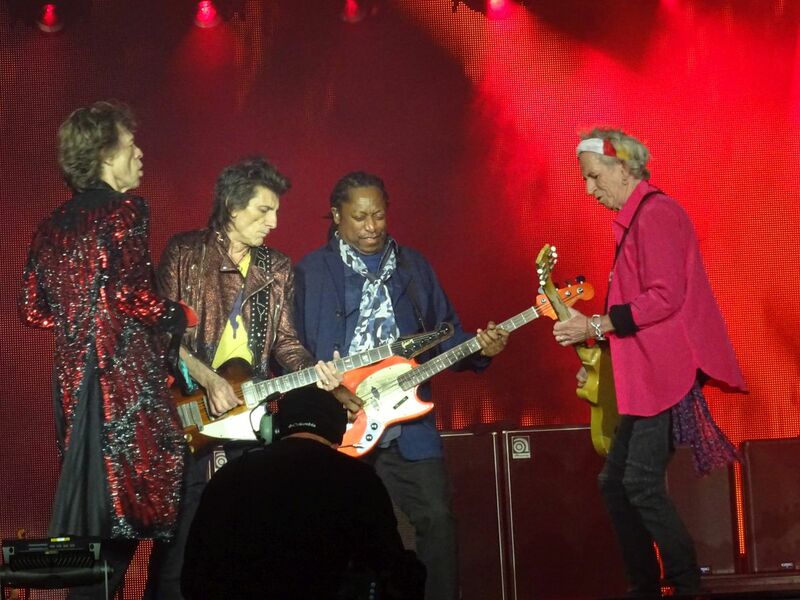 You would miss great moments in Rolling Stones history. 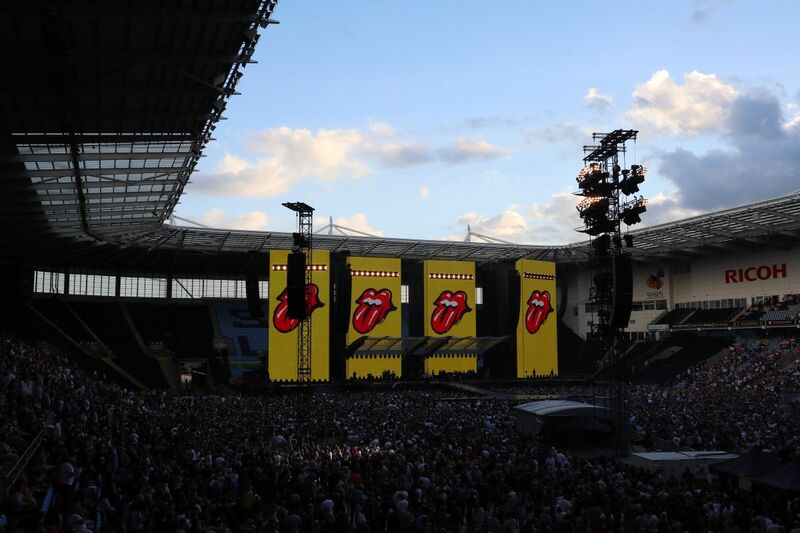 Some parts of a Stones show is staged, of course. 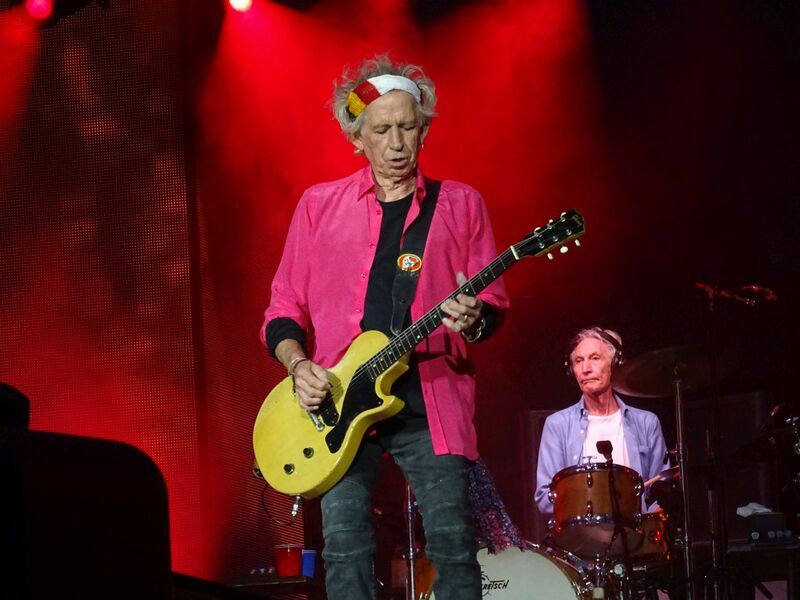 They are professional, and the superfans do know these details, when Mick is joining Keith, when they walk out to the extended stage during Miss You, or when Keith is all over during his great solo playing on "Sympathy" and "Satisfaction". Still, the greatest moments happen out of pure joy and improvisation. It started with Ronnie walking over to Darryl, joining in with him. I made some pictures and you see one of them here. 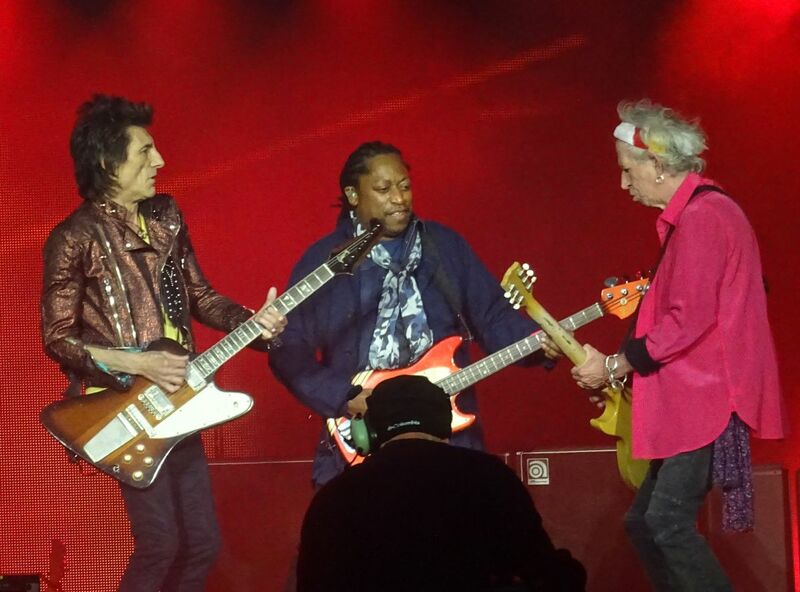 Then Keith was on his way back from his solo, far "Keith" side, and he joined in with Ronnie and Darryl. I snapped a few more photos, one of them are here. Then Mick, on the constant move, see the four of them, as he is passing by, he then joins in for a brief moment, I snap a photo, and then he is moving on, my next photos is showing his back. Great moments and many smiles. 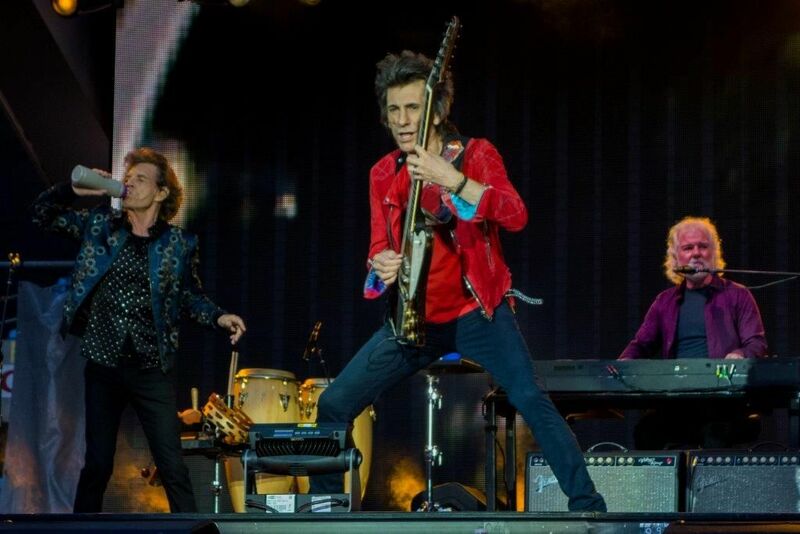 "Jumping Jack Flash". Keith is doing the intro in an unusual way. 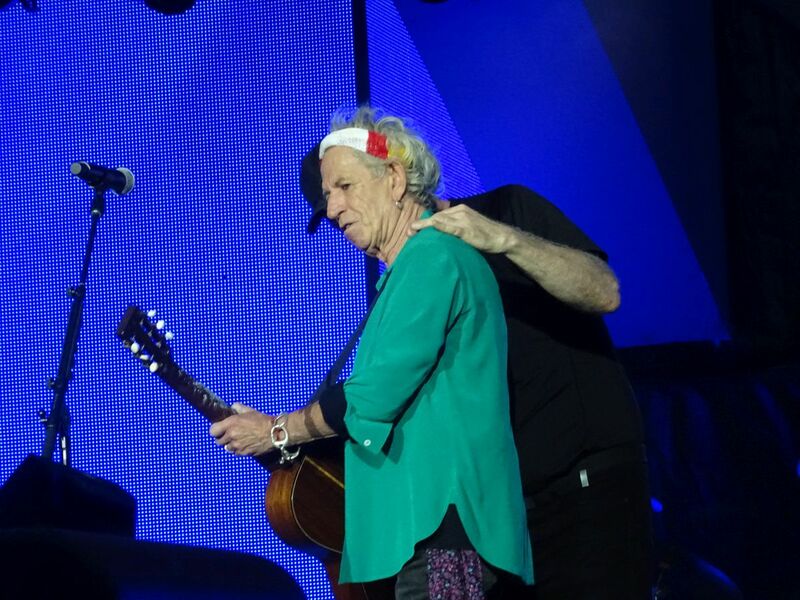 My "Keith and guitar expert" friend, who has been on the tour since the rehearsals in London, is explaining it is the "Ya Yas" way, it is just great, nothing to worry about. Keith does it on purpose. Just love it! 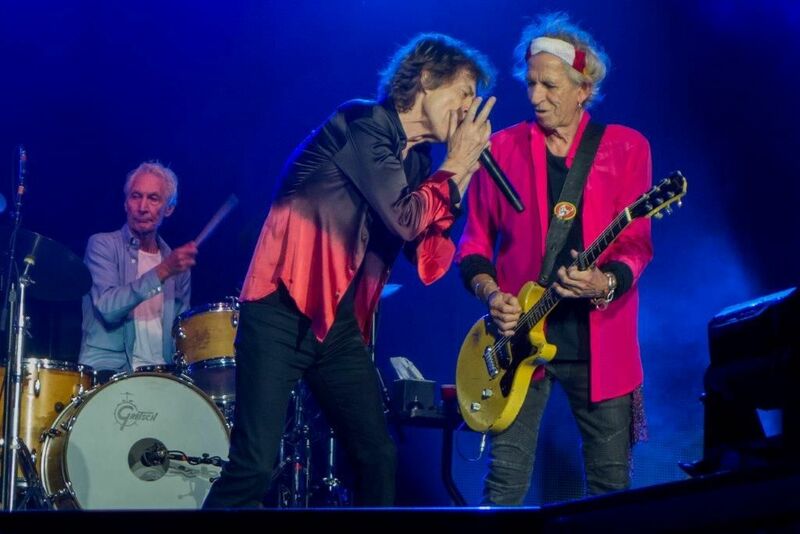 "Gimme Shelter" is a great song, but why do they turn down Sasha to the absolute minimum? When Mick is on he is with maximum power. Sasha do have a great voice close to Merry Cleyton, true to the original "Gimme Shelter" on "Let It Bleed". Please power up Sasha! 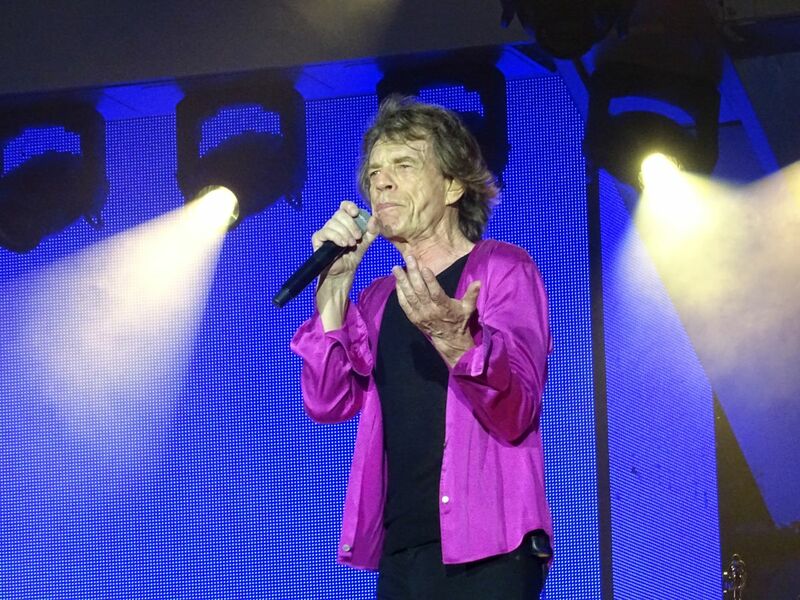 Just as Mick returned to the main stage during the closing part of "Gimme Shelter", I had a slight shower of water in my face, as someone was throwing a cup of water towards Mick. I was between, on the rail. Security rushed out looking for the person who did it, such a stupid act. 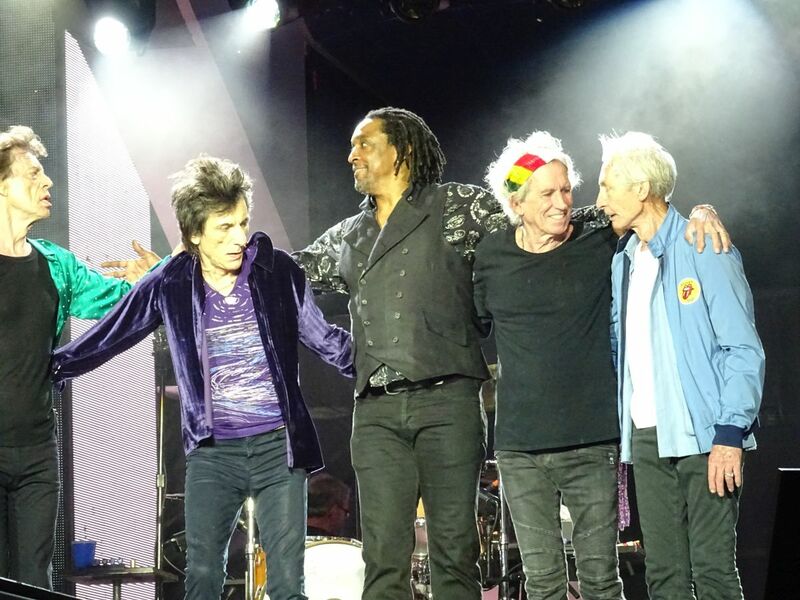 Luckily the crew saw it, and they cleaned the stage so that Mick did not slip on his next journey out on the walkway. 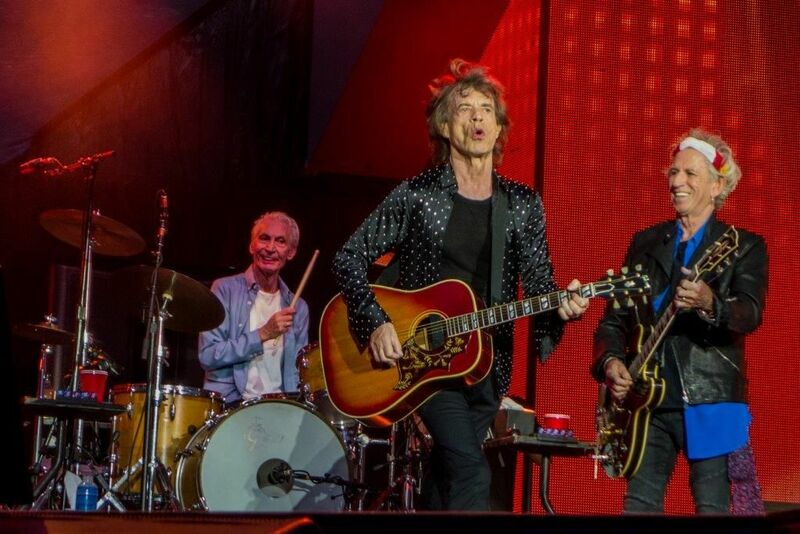 I would not rank the show, like Mick I try to be polite and say they are all great, but if they continue like this, I would not miss any show on this tour. 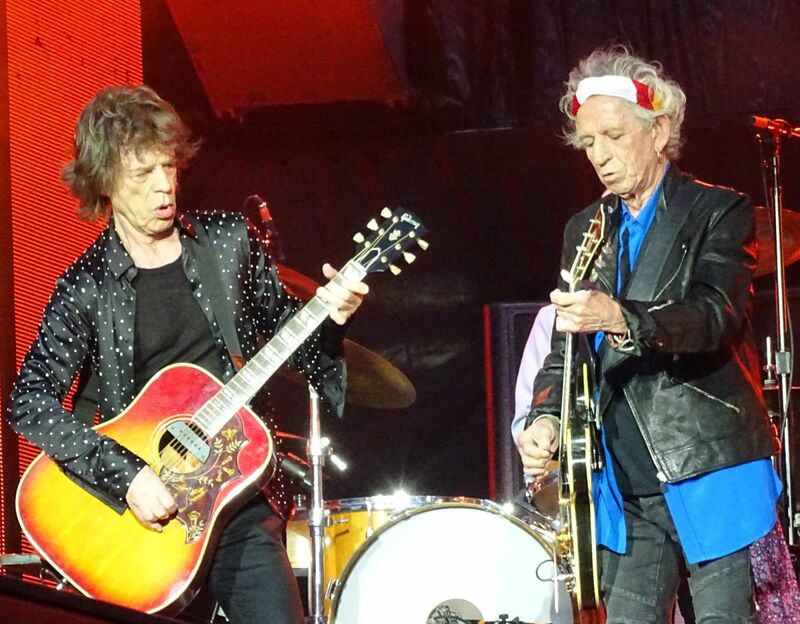 The Stones were on fire, but the crowd was even hotter. While all the UK shows have been VG+, Coventry was NM (Near Mint) due to many factors that weren’t always Stones-related or tangible. For the first time in ages, I was fully engrossed for the entire show, no wandering attention span during “Miss You” or any other songs I’ve heard hundreds of times live already. My 259th show was only my first birthday show. I’m sure there have been many down through the ages, but I missed them all. We sang happy birthday to Charlie during the intros, and he looked horrified, inevitably. 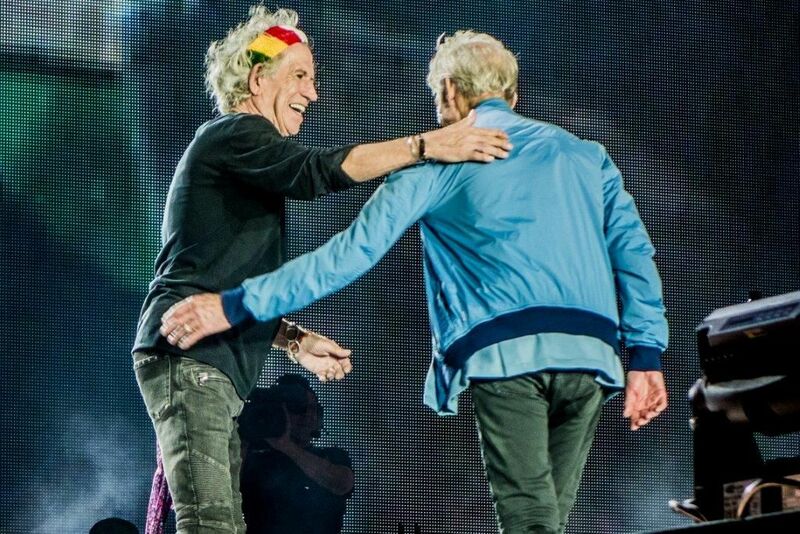 As Charlie fled offstage, Keith intercepted him and gave him a hug. Oddly, we didn’t serenade Ronnie, who was his usual beaming self. Yes, empty blue seats were easily visible. But the fans who showed up were an enthusiastic bunch. Down on the floor, there were a lot of twenty- and thirtysomething fans, young lovers, families, groups of dancing teenage girls. Some chubby guys took off their t-shirts and waved them in the air. 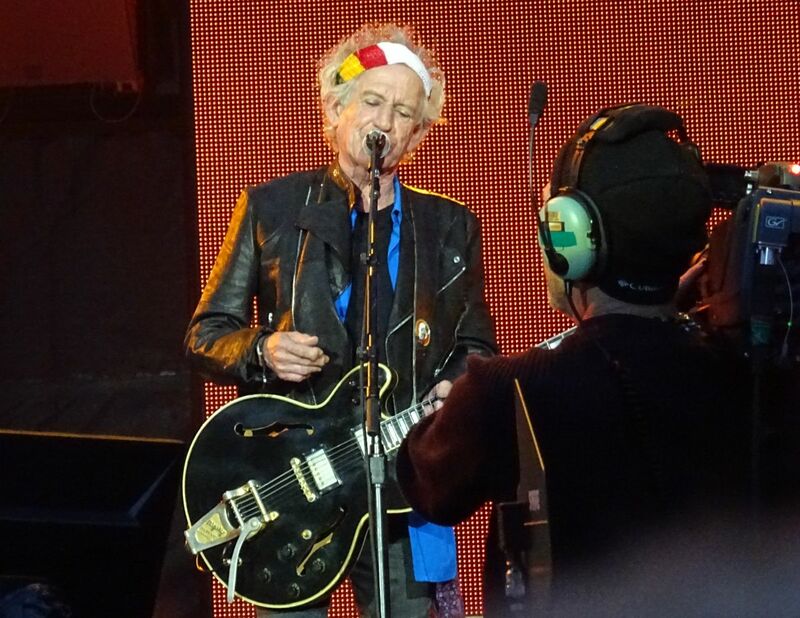 I wouldn’t have voted for “Like a Rolling Stone,” but I was braced for it as soon as I saw Keith’s mic being put into place. 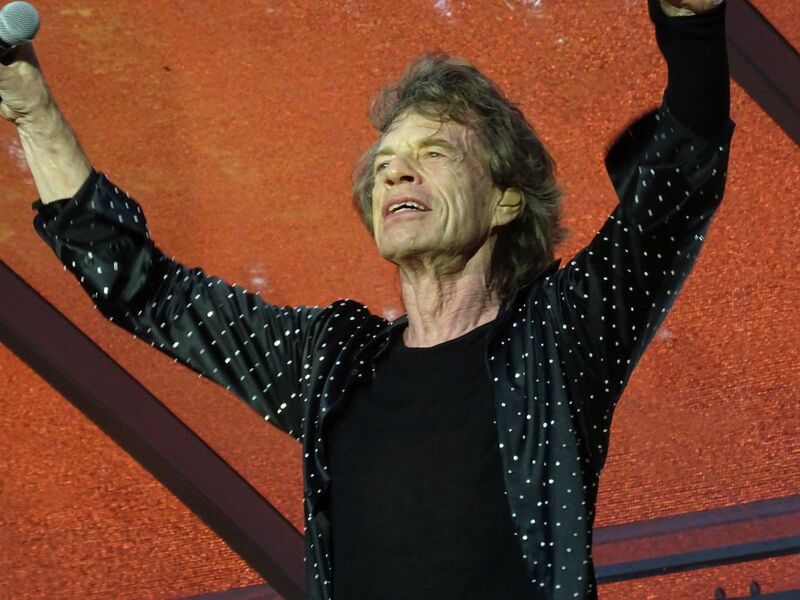 It was the first song that got everyone to the next level of ecstasy: punching the air, singing along like it was the national anthem or “Jerusalem.” I’m kinda wondering if Mick’s thinking, “Hmmm, we just sang four originals and a blues number, and now you’re going wild? 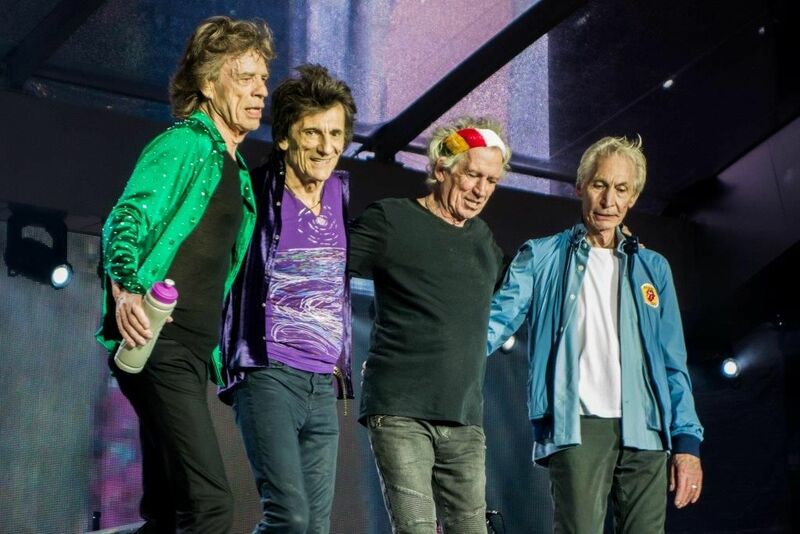 !” It’s an odd cover in the sense that “Like a Rolling Stone” is the most significant rock song of all time, and certainly more literary than anything the Stones ever did. 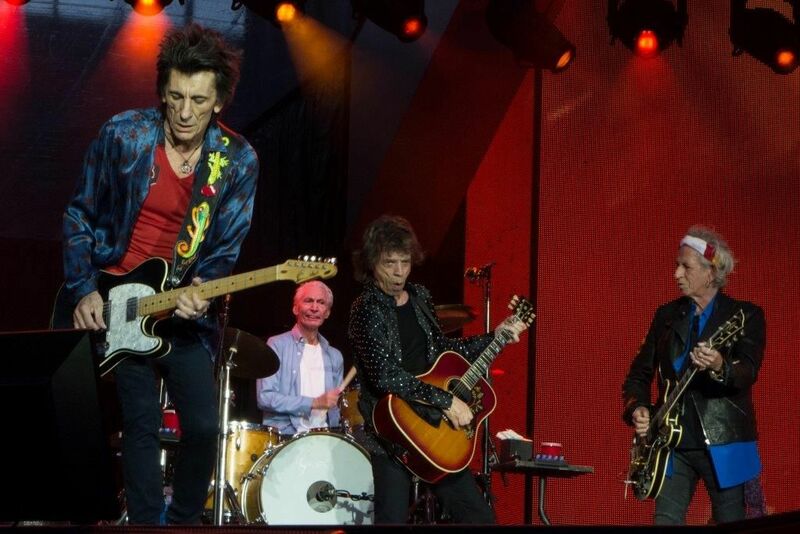 Do you really want to remind people of the songwriting divide between Dylan and the Stones during your own show? This is a philosophical question rather than a quibble, and no one outperforms the Stones. Unlike previous shows on this tour, the volume was loud right out of the box, and it seemed to intensify as the night wore on. But like previous shows, the Sasha solo on “Gimme Shelter” was inaudible. I felt embarrassed for her, and I almost wonder if it’s a deliberate ploy. But then why would they set out to ruin the vocal highlight of the song? Quite vexing. 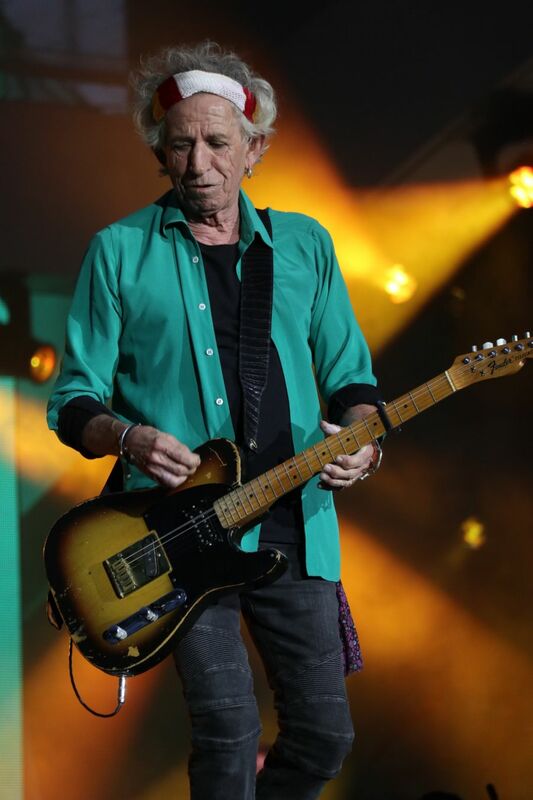 Keith’s guitar work seemed consistently strong. 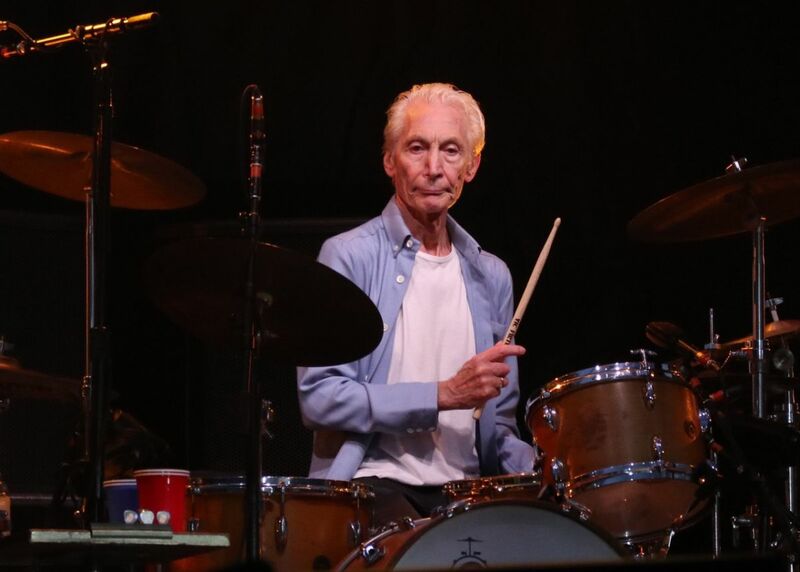 Things went askew on “Happy” when he resumed singing a little too early while Ronnie was doing his pedal-guitar solo, and the song never really quite back on track. 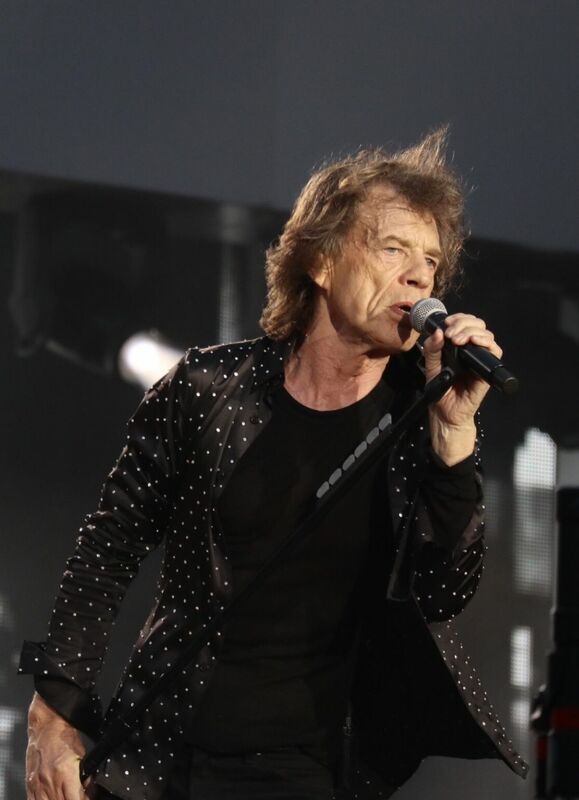 Mick sang about "Kentucky Derby Day" in both the first and second stanzas of “Dead Flowers.” Interestingly he sang “put a fist through your steel-plate door, steel-plate door, steel-plate door” during “Midnight Rambler” probably because he just felt like it. Between-song reminiscences were proforma. 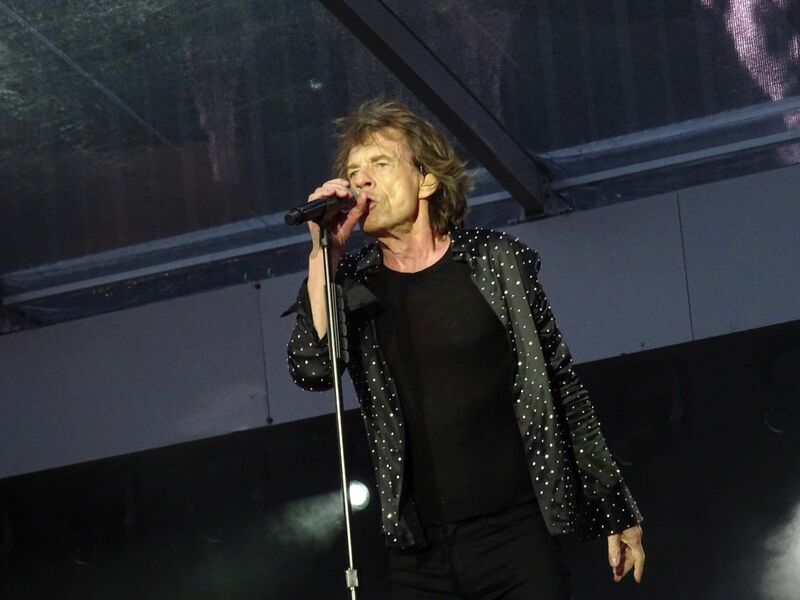 Mick said it was “great to be in Coventry, the jewel of the West Midlands,” recalled that the Stones first played here in 1963, at the Matrix Ballroom, which is now a car dealership, and later at the Locarno, which is now a library. He asked if any folks were from Birmingham, or Leicester, or Nottingham. He veered off script to congratulate us on our singing during “You Can’t Always Get What You Want.” It was “quite honestly the best yet,” he said. “The best choir. 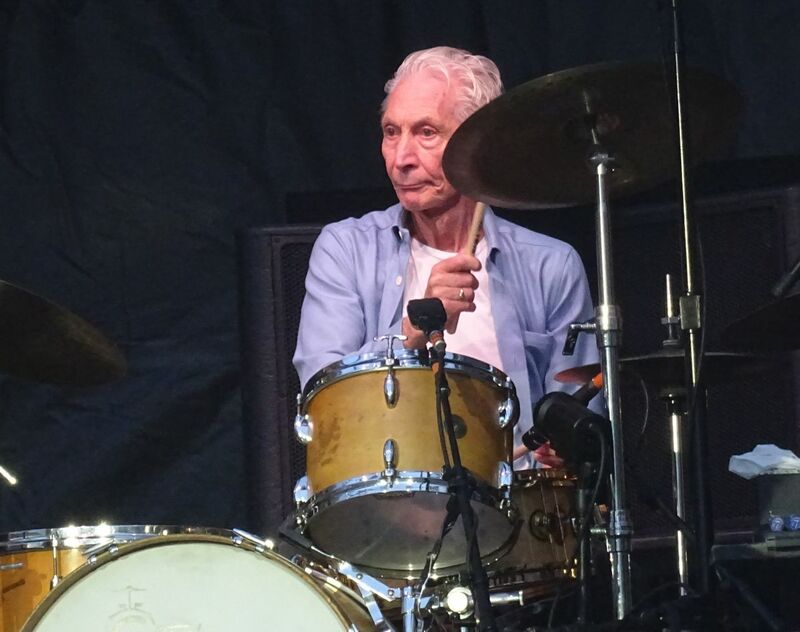 I’m not just saying that.” He claimed that Ronnie and Charlie “have chosen to spend their birthdays in Coventry,” which wasn’t quite accurate as the guys drove in from Birmingham and were back on the A444 within minutes of the final bow. I believe “Paint It, Black” has got notably slower, but possibly more intense in the process. 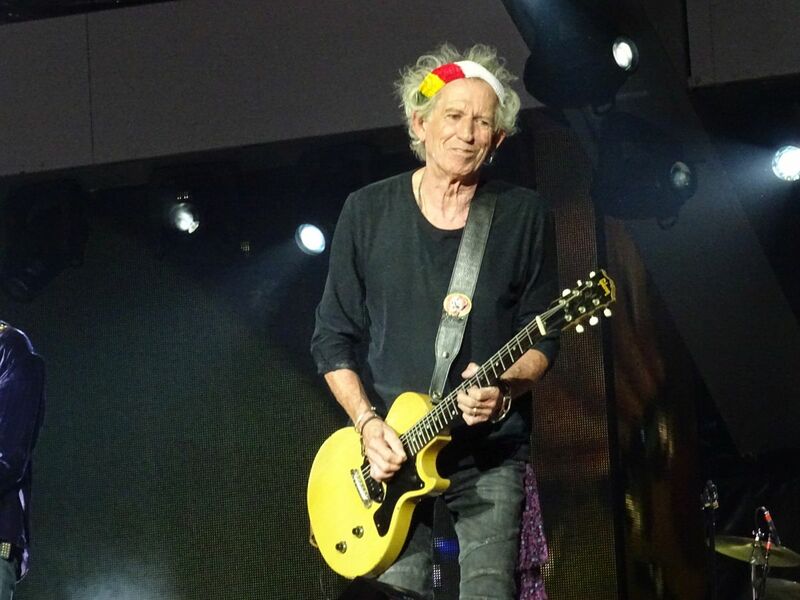 Keith is really shaking things up with his set list. 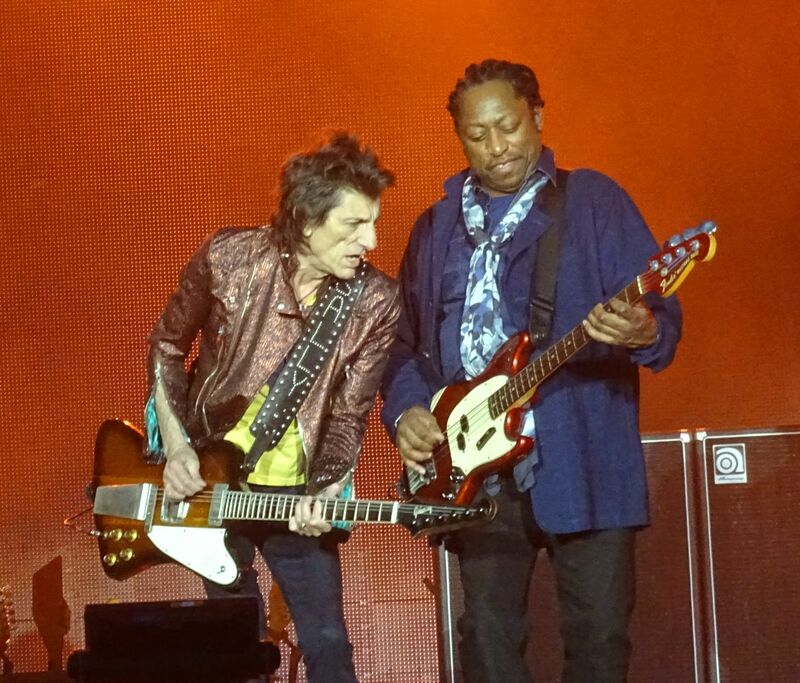 “You Got the Silver” was a wonderful surprise, especially with Keith returning to guitar. Ronnie kicked away his stool during the climactic “Happy” outro. 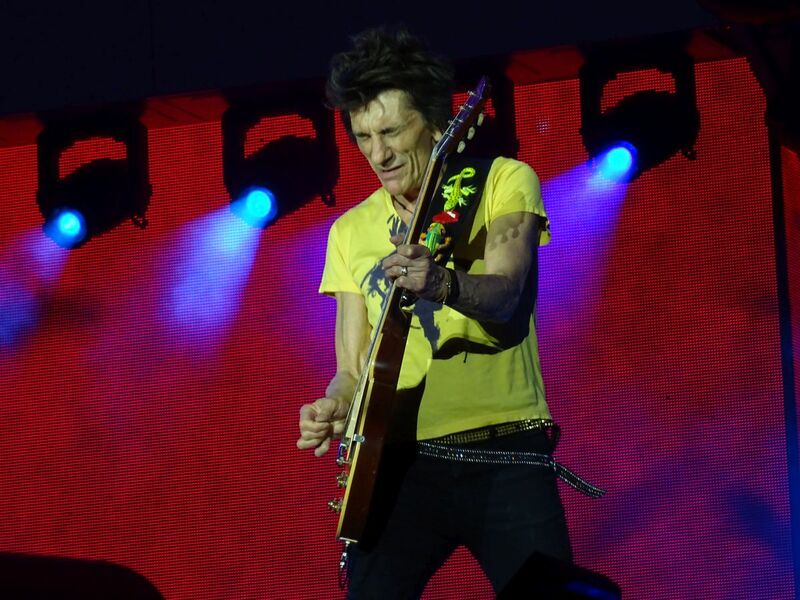 Mick must have done about five turns at the start of “Sympathy for the Devil.” Dizzying stuff. 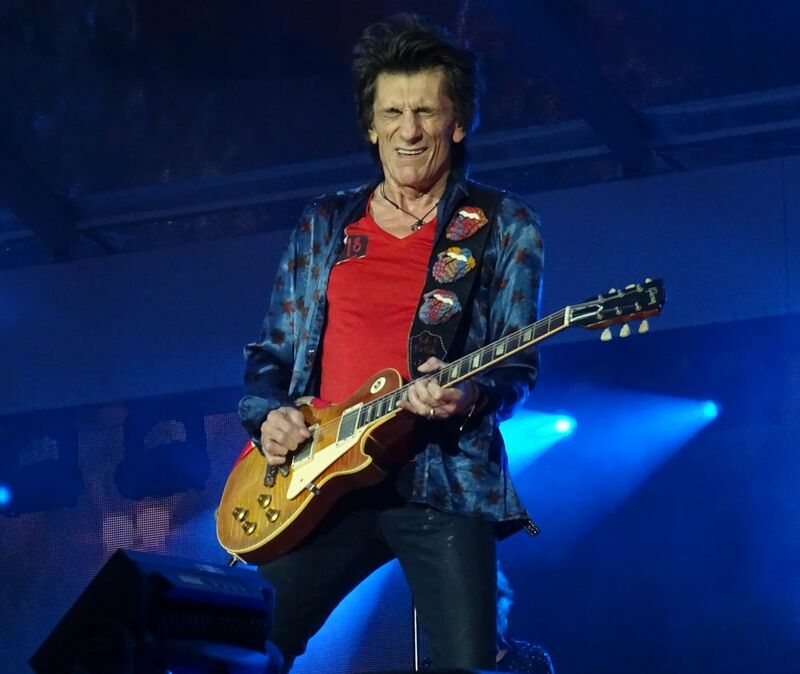 Ronnie sizzled on “Midnight Rambler” and “Start Me Up,” to name just two numbers. 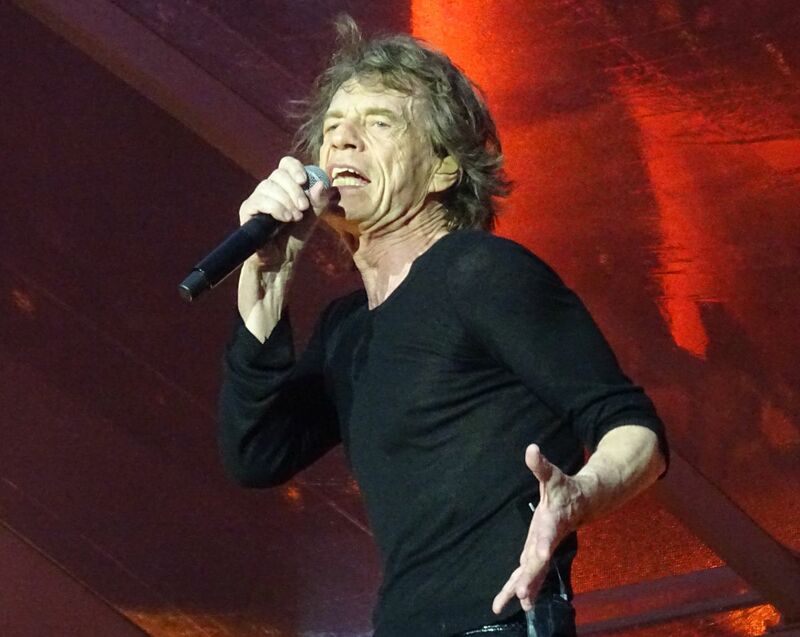 Mick was hit by a cup of water tossed from Pit B while walking up the ramp towards the stage as “Gimme Shelter" wound down. He was unhurt, and a roadie rushed out to mop up the water. I really felt blessed at Coventry, and I am confident things will get even better. Special shout-out to friendly arena staff, efficient bus shuttles, and all the non-smoking British fans.